Connect a second battery to these jackets to automatically switch to TurboHeat mode - 78% hotter. Connect only one battery to heat up in Standard mode like our other garments. 2 jackets in 1, one for extreme cold days and one for regular chilly days. 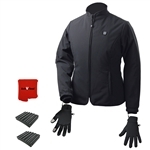 In TurboHeat Pre-Heat mode, these ActiVHeat jackets heat up using a toasty 16 Watts of power. In Standard Heat mode at the Pre-Heat level, the jackets heat up using 9 Watts of power. Having a TurboHeat option adds flexibility with 8 possible heat levels. To utilize TurboHeat, you need 2 ActiVHeat battery packs of the same capacity. 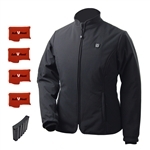 6-layer water-resistant insulated soft shell jacket keeps you warmer and drier. Now with TurboHeat for up to 78% more heat. Includes FOUR (4) ActiVHeat Double Capacity RECHARGEABLE lithium Battery Packs & ONE (1) 6 x AA battery case. Six-layer water-resistant insulated soft shell jacket keeps you warmer and drier. Now with TurboHeat for up to 78% more heat. Includes FOUR (4) Standard RECHARGEABLE lithium Battery Packs & ONE (1) 6 x AA battery case. 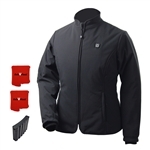 6-layer water-resistant insulated soft shell jacket keeps you warmer and drier. Now with TurboHeat for up to 78% more heat. Includes TWO (2) ActiVHeat Double Capacity RECHARGEABLE lithium Battery Packs & ONE (1) 6 x AA battery case. Six-layer water-resistant insulated soft shell jacket keeps you warm and dry. Now with TurboHeat for up to 78% more heat. Includes TWO (2) standard RECHARGEABLE lithium Battery Packs & ONE (1) 6 x AA battery case. 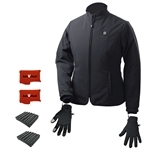 6-layer water-resistant insulated soft shell jacket keeps you warmer and drier. Now with TurboHeat for up to 78% more heat. Includes One (1) RECHARGEABLE lithium battery pack & One (1) 6 x AA battery pack. 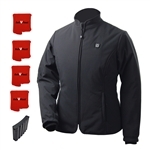 6-layer water-resistant insulated soft shell jacket keeps you warmer and drier. Now with TurboHeat for up to 78% more heat. Includes TWO (2) 6 x AA battery cases.